Ann Condon manages a software development group for a private company (Humboldt Merchant Services) in the financial services industry. Prior to the team’s conversion to Extreme Programming with help from Bob Koss, most of the development had been done in Visual Basic 6, and some of the major applications even had object-oriented characteristics. In addition to XP practices, Bob helped the team learn java and “real” object-oriented programming. Extreme Programming turned out to be an excellent fit with the culture of Humboldt Merchant Services. The first project, which was a complete rewrite in java of an existing application, was going very well. Test-Driven Development proved extremely useful as the new code was extensively refactored during the first few iterations as the team applied their ever-increasing skills in applying design principles and java. But there was a significant problem that the team would have to face sooner or later. The legacy Visual Basic (VB) code would have to be made testable to support required enhancements and bug fixes. A surprise change by a major vendor provided the first opportunity. Humboldt Merchant Services(HMS) had in place a bridge application that used a 3270-emulation Active-X object to send data from HMS computers to the major vendor’s mainframe. The output screens were rearranged and the application needed to be changed to support the new output formatting. Ann went to Bob for help. Ann There aren’t any tests for the code and nobody on the team can figure out how to add tests. Can you provide any guidance? Ann Yes, I read it. It’s an excellent book and covers a lot of valuable techniques, but it really doesn’t address the kind of problem we face with our VB code. Ann Michael assumes that we’re working in a real programming language like C++ or Java. We need to work with VB. I can’t figure out how to apply the techniques in his book. Ann I’m not sure how to answer that. It has objects, but what does it really mean to be Object Oriented? Ann It doesn’t have inheritance. It is possible to implement polymorphism, I remember reading about this, anyway, but we don’t use it. Ann I think you have to implement an interface to get polymorphism in VB. But we don’t use interfaces either. Ann Back to the problem at hand: getting tests into our legacy code for our bridge application. It would be great if we could fake out the ActiveX control so that we could test our code without actually having to send data to the mainframe. I’d like to have a testing implementation of the interface to be sure our code is working. Ann Yes, I can visualize it, but I can’t figure out how to write the VB code to accomplish this. So what good will VB having interfaces do us when we don’t have the source code to the to the ActiveX control? We can’t change it to implement an interface. We bought it and all that we can do is use it by calling its functions. Ann Thanks, Bob (said with sarcasm). Lesson learned. But we can’t go back in time. Ann Yes you did. But I noticed that you don’t have the 3270 connected to anything. Remember that we don’t have the code and can’t make it implement the new Display interface. Ann Yes, I believe that it’s possible. Ann I remember that from one of the talks you gave to the team. The Adapter Pattern solves the problem of converting a message with one name into a method of a different name. That’s not exactly what we have here; the method names are the same. Ann Yes, I see that. I have a question though. 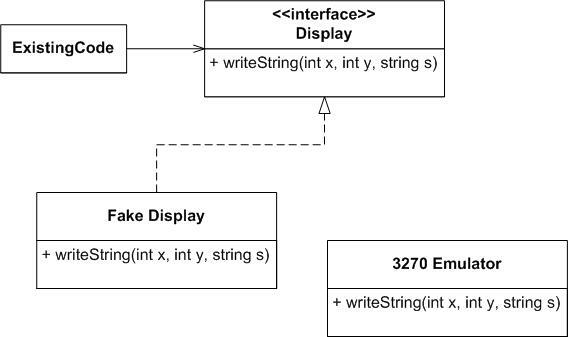 How does the existing code know whether to call the FakeDisplay for testing or the 3270 when we are in production? Ann Let me rephrase: how does the FakeDisplay get instantiated for testing and the 3270 when we are in production?. Ann How does it get passed? There are no such things as constructors in VB like there are in Java. Ann That should work. I think that I have more bad news that I’ve been trying to find the right time to tell you. The 3270 Emulator is actually a control that must be dropped onto a VB form object. 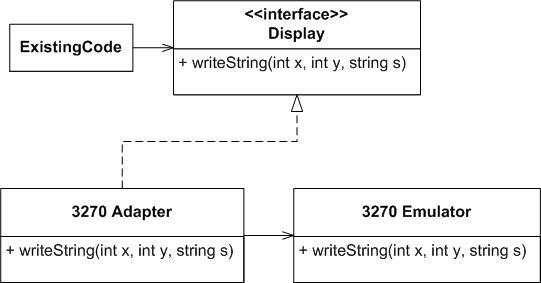 The Display interface must be passed a variant object that will be defined as a VB form object in the implemented adapter interfaces. Ann Yes. And it’s central to everything we do in VB. You might say it puts the V into VB. Ann I don’t think it does – it’s just a VB thing. I guess it doesn’t matter as much as I thought it would. Ann It looks like it will, but as you’ve said many times, only the code will show if it works or not. I can’t wait to try it. Ann Sure, where shall we go? I am learning the course from Bob right now.